When talking about a wood stove fan it basically refers to one of the greatest ways of evenly circulating warmth to all parts of your living room. With the recent increase in the fuel prices and modern stove designs, most of the homeowners are now turning to multi fuel and wood burning stoves. The stoves are eco-friendly and importantly saves a lot when it comes to the operating costs. Normally a wood stove fan is composed of rotary blades which are purposely designed to circulate the warm generated air evenly across your living environment. The important part about the fans is that they do not require any batteries or electricity since they are powered by heat generated from the stove. 2 How are they different? Stove fans are usually powered by the heat generated from the top of the heat activated stove. The fan is usually placed on the top flat surface of the wood stove. After loading your stove, ignite it so that stovetop can commence warming the fan as well. Normally, when the base of the fan reaches a certain temperature, it uses its thermoelectric motor to convert the thermal energy into electric energy. This then causes the blades to rotate. As the blades spin, they cause heat coming from the stove to quickly and evenly circulate throughout your room. It usually works automatically; you only set it and forget. You only need to occasionally check and replace the motor which might wear after some time. With its unique source of power, you do not entirely need electricity or batteries for its operation. These devices are different from other fans in the sense that they do not require batteries or electricity for their operation; they use self-generated heat which is produced by the wood stove. Additionally, they operate silently. The only moving parts there are the blades which move quietly. This ensures you enjoy the warmth of your room in a comfortable living environment. Moreover, the fan used is universal in all the heating stoves; the fan used in circulating the warm air can be used with the pellet wood burning, gas or coal stove. A good wood stove should be able to automatically detect particular temperatures which will activate the blade to start running. This basically means you no longer to manually switch it on and off which is generally easy to forget. Always each and everyone prefers to get something that is easy to operate and install. Ideally, when purchasing a functional and new wood stove fun you want one that fits perfectly without popping out of your wood stove. 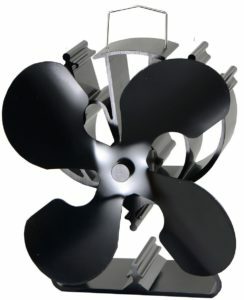 The fan ought to be easy to use and importantly install in your living room. Normally, there is noise making wood stove fans and importantly there are others that operate silently. A good stove fan should be able to control its noise since the noise is most of the time disturbing. Always go for a fan that is quieter. This essentially refers to the minimum temperature that is required for the blades to start running. If your stove runs at a lower temperature, then go for a fan that requires lower starting temperatures and vice versa. One of the best wood stove made in Canada, Black that warms your room 31% faster. Importantly, the Ecofan Ultra air can actually be used in rooms of up to 240 squares feet and circulates warm air far into the involved room. Research indicates that Ecofan 810CAXBX Ultra has been tested and found to save you up to 14% in fuel and crucially efficiently able to distribute heat from the wood stove to any part of your room. One major advantage of the wood stove is that there is no electricity needed. The Ecofans basically generates power through the conversion of heat from the stove into substantial electricity. Additionally, Ecofan 810CAXBX Ultra has more than 20 years of experience and comes with a 2-year limited warranty. The device increases the comfort of your room and can actually get to a surface temperature of between 1000C and 3450C. In a nutshell, Ecofan Ultra Air is one of the most economical ways of moving hot air throughout your room. The capabilities of generating its own electricity and transmitting about 125 cubic feet per minute (CFM) of air, Ecofan 810CAXBX Ultra fan is an ideal option for those who want to save on fuel and importantly enhance the efficiency of their stove. Some other additional benefits that come with the Ecofan 810CAXBX Ultra include adjusting its speed with the surface temperature, silent operation and easy to operate and use. Warm faster- With an original or rather a genuine Ecofan 810CAXBX Ultra, your room will just warm in a matter of minutes. The heat powered stove fan is primarily meant to sit on top of the free-standing stove so that it can efficiently distribute heat from the stove to different parts of the room. The Ecofan Ultra Air is able to enhance your comfort up to 38% faster. Burn Less– Research indicates that Ecofan 810CAXBX Ultra minimizes your fuel usage and importantly reduces the environmental problems by 18%. It’s able to effectively distribute heat from the stove to different parts of your room. Self-regulating Ecofans– As the wood stove heats up, the fun automatically rotates distributing heat further into the room, as the stove cools, and the Ecofan slows down and finally shuts off. Silent operation- The fan operates silently distributing heat right from the basement buck Stove to all the corners of the room. No electricity needed- Ecofan 810CAXBX Ultra does not need any type of electric power. It essentially generates its own power by converting heat from the wood stove into electric power. Ecofan 810CAXBX Ultra has been tested and proven to save you up to approximately 14% in fuels and crucially, effectively distribute heat evenly in your entire room. An ideal option for rooms of up to 240 square feet. Moreover, the Ecofan Ultra Air is able to distribute air to the furthest point of your room. The Ecofan Air which is generally the mid-sized Ecofan model is able to warm up your room up to 31% faster. Another ideal option when it comes to heating your home. With its efficiency and effective way of operation, you can actually use it as the main source of home heating. By just placing the fan on top of the wood or coal burning stove, it automatically starts working when the temperatures get 185 degrees Fahrenheit. Importantly, the fan normally circulates the hot air in the room at the rate of 130 cubic feet per minute. The warm air is evenly distributed to every part of your room without any excessively cold or hot spot. Moreover, the Heat powered 4 blade Stove Fan from Boone Hearth for Wood Stove is environmentally friendly since the entire process is a low-emission wood burning process. Furthermore, this is an affordable way of generating heat; no electricity or batteries required for the stove to heat. For added efficiency and safety, the wood-powered stove fan comes with a wood stove thermometer. 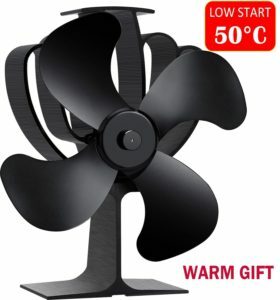 There is usually minimal handling of the sturdy fan but you can just adjust it while it’s moving. The fan operates silently. Free stove thermometer included– The heat powered 4 blade fan features a free Boone Hearth magnetic color-coded thermometer. 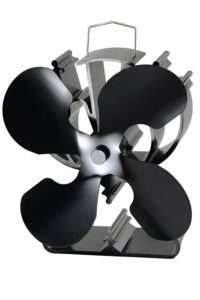 Four blade design– The fan comes with four blades. Importantly, it fans evenly circulate air in the room at the rate of 130 cubic feet per minute. Completely silent operation- This guy is entirely unobtrusive and convenient in all its operations. A universal fan used in all the heating stoves- The fan used in circulating the warm air can be used with the pellet wood burning, gas or coal stove. No batteries or electricity needed- The stove burns the wood releasing heat which is then converted into electricity by the fan blades. There is no electricity or batteries required to rotate the fan. One of the best heat exchangers that expands the comfort zone of your house. Importantly, the Aobosi stove fan utilizes the Seebeck Technology that enables it to create its own electricity. When the wood log is burnt in the stove, it emits heat which is then converted into electricity by the fan blades. The power produced is then used in distributing the heat emitted further into every part of the room. Normally, there is no electricity or battery required to run the fan. This an important item that avoids trapping of hot air around the stove and importantly ensuring that the hot air is not only rising to the ceiling but also moving throughout the room. With the Aobosi, you do not need to necessary stay close to the fireplace since the heat is evenly distributed in the room. Additionally, the Aobosi Stove fan normally starts to rotate automatically when the temperatures get 1220F (500C) which is generally lower than other wood stove fans. The hotter the temperature, the faster the fan rotates and importantly the warmer air circulated and vice versa. Unlike many other noisy fans, the Aobosi works quietly enabling you to enjoy the warmth and user-friendly and comfortable environment. As if not enough, the item is a good indicator that reminds you when to add more wood to your stove. When the blades start to run slowly, it means the fire is going down and you can add more wood or logs to your stove. The Aobosi Stove fan is an energy-saving device that cuts you the fuel bill while you get the maximum heat from your stove. Fast start with lower temperature– the wood-powered stove fan automatically starts to run when the surface temperature gets 1220F (500C). This is a temperature is lower than the temperature required by most of the available analogs. The hotter the temperature, the faster the fan rotates and importantly the warmer air circulated and vice versa. Heat-drived electric motor, no main power or batteries required. The device primarily utilizes wood or logs that are burnt in the stove so that heat can be produced. The heat is then converted into electricity by the blades. The power generated is used then used to circulate hot air further through the entire. There is no batteries or electricity required. Silent operation, higher efficiency– The outstanding design used and exceptional engineering makes it operate quietly and hence optimum efficiency. There is no need for you to install hassle-free. You will just enjoy the warmth of your house in a very comfortable environment. Cuts fuel bill and saves energy- the Aobosi blower utilizes heat from the wood stove distributing it to every part of your house. Consumes less wood but you get the maximum heat from your stove. In a nutshell, this is a completely eco-friendly device. Safety design and warranty- The awesome wood stove is fitted with a bi-metallic safety device on its base which basically protects the pellet stove fan from extreme temperatures. As the temperature reduces, the Ecofan also lowers to normal. The item has a warranty of 1-year. Doesn’t output enough current to turn the motor very fast. VonHaus 3-blade Oscillating stove fan is one cost-efficient and self-powered device that enhances the efficiency of your wood stove oven with its VonHaus Oscillating stove fan. Importantly, the fan creates its own energy through the burning of wood or logs and it’s entirely powered by the heat from the stovetop. The VonHaus ensures that your room is effectively supplied with the hot air through efficient circulation. Normally, there is no electricity or batteries required for heat to be generated. When talking about its oscillating function, the fan usually comes fitted with a thermoelectric element which basically acts as a generator that powers the motor the moment it detects a temperature of 700C. The essentially the temperature at which the circulation of air in the room commences. Furthermore, the oscillating features of the VonHaus move in the direction of the heating with an angle swing of 400. This is very important since it gives chance for even distribution of hot air across the room space. The fan rotates automatically at a speed of 1600rpm which basically mean that it circulates between 110 and 140 cubic feet air per minute. With VonHaus fan you feel the benefit in no time; the room warms faster. Oscillating-rotating function- The oscillating swing of the VonHaus blower is 400 which gives room for a more even and fluid distribution of hot air in the room. Additionally, the device operates optimally between 158 to 6600C of temperature which is self-regulated according to the room temperature. It circulates at a speed between 110 and 140 cubic feet air per minute. 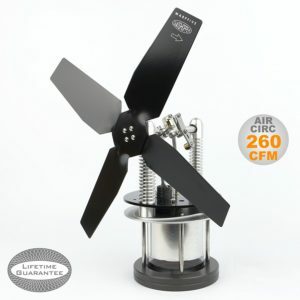 Economical, pivoting, oscillating, rotating heat powered manual stove fan– This primarily to increase the effectiveness and efficiency of your wood stove fan as it generates warm air for your entire room. Each blade measures 2.2 inches while the between 110 and 140 cubic feet air per minute overall size is 9 x 6.5 x 3.7 inches. Self-powered- there is no electricity or batteries required. The thermoelectric feature that is fitted acts as a generator to power the fan’s motor. Not easy to adjust since the adjustable screws are unreachable without dismantling it entirely. Another top-performing wood stove fan made from anodized aluminum which will actually not corrode or rust. It is self-powered and importantly generates its own power from the wood stove. Its base is fitted with a bi-metallic strip which is meant to slightly raise the edge of the fan as the optimum temperature is being approached. The wood stove should not operate above the recommended temperature of 6600F (3500C) else the electricity generating unit and the fan will be damaged. You just need to place it on the stove top to make it run. The hotter the stove gets, the faster this thing works. It’s always recommended that you remove the fan from the fan when the temperatures get 6600F (3500C). The Voda 4-blade Heat Powered Stove Fan is very significant because it ensures that instead of hot air raising vertically to ceiling, it uses its blades to horizontally divert the warm air so that it can be evenly be circulated in your room. The Voda 4-blade Heat Powered Stove Fan is easy to install and operates silently. As a matter attention, never handle the Voda 4-blade Heat Powered Stove Fan from the base or any unprotected surface when hot; if at all you have to carry it or move it from one point to another, use the extendable handle while wearing the appropriate gloves. Heat powered- generates its own heat using the wood stove. There is no batteries or electricity required to power it. Less consumption, more efficiency– because of the more efficient heat circulation, you can save some money on fuel. Efficiently circulates warm air throughout the room. This achieved by the rotating fan which ensures that the warm generated air is evenly distributed in the room. 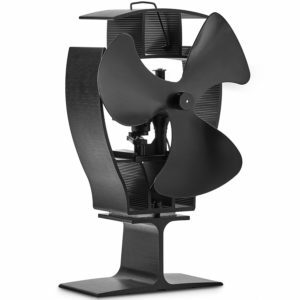 Whispers- quiet and easy to install- The only moving part of the wood stove fan is the blades. You can’t even realize the fan is there until you feel the warmth. Additionally, the item doesn’t involve any rocket science when installing it. Just place the fan on a flat top surface of the stove and it will start working. 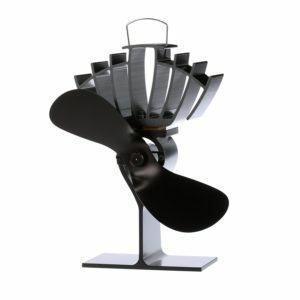 Warpfive Grasshopper stove fans are wood stove fans that are meant to enhance the hot air circulation in your house. This very important because it saves you of the heating fuel and crucially offering you a more comfortable living atmosphere. In a nutshell, the fan silently circulates the heat generated by the wood stove saving on the operation costs, increasing the heat efficiency and significantly providing you with a comfortable environment. Normally, the part of your room that’s close to the heat close will become hot while the other parts are insufficiently heated. The Warpfive stove fan ensures that generated heat is sufficiently circulated throughout the room. Additionally, the Warpfive stove fans are always eco-friendly fans that operate quietly and on self-generated heat, they do not require any battery or electricity for their operation. Importantly, the Warpfive stove fans use the principle of the Sterling engine which was invented by the British clergy, Robert Sterling in the year 1816. The sterling engine converts difference in temperature into motion. This principle is highly noted for its longevity, quiet operation, high efficiency and importantly the versatility in which it can make good use of any form of the source of heat. The Warpfive Grasshopper stove fan has a lower start-up temperature of the only 700C (1580F) and importantlycirculates at 260 CFM of air. Clear Borosilicate glass cylinder– facilitates the rhythmic displacer movement view which is very important in the production of the energy required to circulate the fan. Designed to work with cooler fires such as the Soapstone which is irregularly fed on top of the cooler stove. Sterling engine– converts the difference in temperature into motion. The principle is highly mechanical and does not have any electrical element which may stop it when overheated. With the above review, it’s undoubtedly that wood stove fans are some of the best items when it comes to warming your living room evenly. The wood stove fans depend on a self-generated heat which is produced by the stove. The blades on the on the fan then converts the heat into electric power that is used to drive the hot air throughout your room. If you want to enjoy sufficient warmth in your living room and enjoying the comfort of your room, then get yourself a wood stove fan.